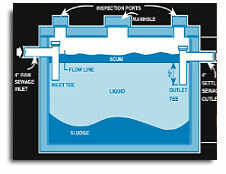 How a septic tank works is basic plumbing and biology. All of your household wastewater exits your home through a pipe to the septic tank. Bacteria grows in the septic tank and digests the solids that are in the wastewater. The bacteria reduces the solids into liquid, fats and grease, and insoluble particles. The fine insoluble particles settle to the bottom of the septic tank forming sludge. Greases and fats float to the top forming a scum layer. The liquid, effluent, flows through the outlet pipe into the absorption or drainfield.